Spoken language is insufficient to come to grips with existence and it’s meaning, and therefore other forms of expression are needed. In my work I aim to be thought-provoking to arouse an inner awareness. I have always been interested in exploring the scientific miracles of the natural universe, especially the thin biosphere that covers earth. 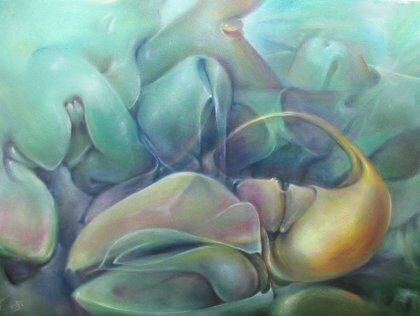 The paintings of the last decade focus mainly on biomorphic phenomena, evolutionary forces, and propagational drives forming the basis of gender interaction, but arousal of the hormones is not my objective. My intention is to transcend the superficial, socially established eroticism of sexuality. I do not copy nature. My work does not represent reality as we see it, but attempts to demonstrate the experience of the forces essential to the continuity of life on Earth. Ultimately, my mind, my eyes, and my hands were merely instrumental in producing this work, and in spite of knowing better, I do frequently have the experience that the work was not created by me, but through me. My art has a chance for limited survival, but I know my body does not.